After making a kid's bow, I got kind of hooked on building bows, and since I like trying unusual, but loclly available materials for making things, I decided to try a black (sweet) birch sapling, as a start. I have just an unlimited supply of these. It's not a generally recognized bow wood, but I know from FPL tables of wood properties that it has a very high modulus of elasticity (stiffness, in other words) -- higher than most recognized bow woods. Not that that means everything, but I figured, it's everywere here, might as well give it a try. The first sapling i cut was straight an pretty clean for 14 feet and then less so above that. I cut it into three 7 foot sections and peeled the bark and sealed the ends. I figured it would take a couple months at least to dry the pieces, but it wouldn't hurt to take the worst, upper, section and split it with the bandsaw to dry faster. When I checked it with a moisture meter a week later I was very surprised to see a reading of about 13% -- down from 50% green, and no checking. I decided to trim it down further, and lined out a bow roughly as shown above. The lines are a centerline that follows the grain and high point of the stave, and the two outer profile lines that more-or-less follow that outline's curves, and taper. This is all done freehand. I also followed the grain around knots -- there were two medium sized ones near the center handle area, and one rather large one (toward bottom of the photo below). The knots and curves of this piece would be a real challenge for a beginning bowyer like me, but I figured what the heck, the forest is full of birch, and it's something to do. I trimmed to the rough outlines with a hatchet. The bow's "belly" (the part that faces you). The "back" faces the target. You can see the knot all the way through and how the lower limb curves to follow the grain. The bow set up on the tillering tree. I've tapered the belly in thickness to get it to bend. The taper isn't even, but must be thicker where the knot is to compensate for the reduced strength there. that's on the left side in this photo. It will be the lower limb. You can also see that the limbs aren't the same shape either. the left one bends forward in "reflex" then back again in "deflex" much more than the right (or upper) limb. I've also laid out the handle off center. The bottom limb is 2 inches shorter than the top, to compensate for how we moderns tend to pull the bowstring with 3 fingers. Index finger on top of the arrow and two fingers underneath. That tends to pull the limbs unevenly, unless compensated for in the construction -- you can either make the lower limb stiffer, or shorter than the upper limb. The bow is here set up to tiller "with the long string" -- a string longer than the usual bowstring. I did not realize this when I was working on this bow, but the long string should actually be shorter than I show it here -- this is too long. It should be tight to the bow, but not bending it. There's a scale and a rope to a pulley and back to me at the camera so I can bend the bow. Here I'm bending the limbs a little to check the curve (or "tiller"). The limbs should bend equally if the same length, and no knots or defects, but it gets a little more complicated if the limbs are unequal intentionally, and there are weirdnesses in reflex/deflex, grain, etc. You kinda have to use intuition and estimation to get what you think is right under the circumstances. Here the bend is small, because it's early on in tillering. You don't want to overstress the limbs -- never pull them down past the intended draw weight for the bow (in my case 40 lbs), because you will add set that way (permanent deformation, not elastic change) or worse, break a limb. Actually, you probably should not pull more than a little over half the draw weight early on. I tried to stay at about 25 lbs. before shaving more wood off of the belly side of the limbs. You gradually remove wood and tiller on down until you can bend the limbs evenly all the way to your intended draw length -- 29" in my case. It's easier to tiller to a shorter length (like say 24") than a long one -- but I have long arms, and that's my draw length. The draw below is showing 20", but since it's the long string, it must be calculated minus the slack, which was about 7" --so this was really only drawn to 13". Long way to go to get to 29"! Notise that the above left limb is a bit smoother in profile thickness than the first tiller photo. That's because a fair amount of wood has been shaved off while tillering. The goal in using the long string is to get the bow to the point where it can be "braced" -- that is, flexible enough that you can put on a proper length bowstring with the bow bent to its normal strung curve, at rest. Tillering then follows with the bow braced. It's a lot of back and forth checking and removing wood, until the bow finally draws to its intended draw length. You also gradually increase the draw pull until when near your draw length, you are also near your intended draw weight. Here's the bow fully drawn to it's draw length and weight. It looks a bit uneven, but there are many knots requiring thicker areas. The tip on the right looks a little flat, but that one has natural reflex, more than the other. Some of this will be evened out by heat treating later. After tillering, I smoothed the edges and sanded the bow, being careful to do the minimum possible to the back -- the natural side of the bow. This is the tension side when the bow is drawn. And black birch seems to fail first in tension, in the sample test stick I tried. So we try not to disturb the back of the bow too much. It has a lot of irregularity, knots and deep camber. That's typical of a bow made from a sapling. as opposed to a board bow, made from sawn straight wood. Or even a "stave" bow which comes from a larger tree, split into staves. Those generally have less camber on the back, though may also show grain irregularities, depending on the stave. Some people call this kind of thing a "character bow", but I don't particularly like that name. I think of it as a natural bow, where you've worked with the natural growth pattern of the sapling it came from. It's tricky -- you have to read it and undestand the wood flow lines, like it was water flowing along the length of the bow and around obstacles, like knots. You have to kind of feel for the strength of the wood as you go along. Because you're going to stress it to near its limits. Here's the edge view of the bow. I've shot about 200 arrows through it at this point just to make sure it would stand up. They say a thousand arrows determines its true worth. You can see some set in the limbs -- they curve up in deflex -- towards the belly, and the archer. That's not desirable, it reduces the power of the bow and the speed. Flat or some reflex when unbraced would be better. I think there was about 3" of "string follow" -- the distnce between the bow and the tips in their permanently set deflex. You can also see some reflex in that left tip -- where it bends back. the right tip is relatively straight in this view. Too much set and string follow and uneven tips, some twist, all can be remedied to some degree by applying heat to the belly -- toasting it and applying pressure. This also has the effect of stiffening the bow a little. I used a heat gun and very lightly toatsed it -- I don't know how much is good and how much is detrimental -- no experience with that. Here is the belly toasted. You can see the limbs slightly browned from the heat.. It did even out the bow quite a bit, and cut the string follow in half. It also increaased the draw weight a couple pounds, so it was a definite advantage. Here's the handle area -- located between two good sized knots. The handle had been wider before -- same width as the knots, but that wide handle put a lot of strain on my wrist, and didn't fit my shooting style. So I narrowed that area, and in effect made the knots into "fades" -- the usual swelling out place for the limbs. I still followed natural grain flow lines, so it also looks quite natural here, as if the narrow section grew that way. But of course it didn't. Sometimes a practical purpose aslo suits an aesthetic one! Another problem with the handle area for me was, it reduced my draw quite a bit. The bow had become only 3/4" thick there, while most conventional "hard" handle bows might be 1-3/4" thick or more. If you subtract 1" from the handle depth, it brings the bow that much closer, and reduces your draw by 1". I hadn't realized that before, but I did once I started shooting aroows through it. But I had reduced the thickness of the handle to get a better curve toward the center of the bow. I had made in effect what is called a "bendy" handle -- one of the two different handle styles. So how could i add thickness and still retain a small amount of bend? Some people pad it out with leather -- though not an inch worth. I thought about it for awhile, and wondered if I could lash a short length of wood, like a stick of some sort. Rather than glue a piece of wood on -- which would make a stiff handle. It would need to be of fairly bendy material and fit in a way that might allow some movement. I decided to try a piece of grape vine, which grows wild around here in the woods and cn be up to 4" thick. I found a piece of the right side and shaped the bottom for a slight rocking fit on the bow. What an interesting topic, specially for one who has no idea about bows and arrows except that which most boys go up to in my youth some 70 odd orbits ago. Thank you for sharing. Oh, and I like the bushland looking setting of many of your photographs and if it's your back yard - lucky you. Steve thank for a very detailed description, it makes a nice change to read up on a totally unfamiliar subject. Longbow by Robert Hardy which details the social and military history of the bow. However it will have to wait a few days while I finish "Vegetius: Epitome of Military Science" as although I'm reading it in translation from the Latin text, it takes concentration! Agreed, Steve has made this a really fascinating and instructive topic. We visited The Heritage Dockyard in Plymouth last weekend which gave me a chance to have a good nose around the archery part of the Mary Rose exposition. Apparently the bofffins recognised the skeletal remains of the archers by the development /deformation in their shoulders and spines. 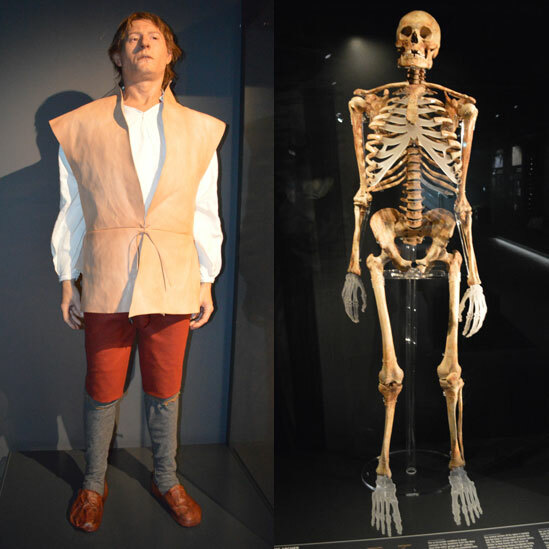 They had the mortal remains of one poor devil standing alongside a forensic reproduction of what he would have looked like in life. In todays terms we'd call him a powerfully built man of medium height, with a big barrel chest on him, a sort of old style rugby front row forward. The draw weights of the bows dredged up varied around the 120 to 180 lb mark, so they needed some big well trained lads to handle them in battle. One thing that in hindsight is obvious but I hadn't fully taken on board (groan) is that a longbow is actually very long, I'm five foot ten and they were taller than me. If you get the chance of a trip to the Dockyard and the Mary Rose don't pass it up, for folks of a technical turn of mind it's well worth the entrance fee. I'm glad to be able to talk about bows here -- that's the nice thing about this forum, it's not limited to just one specialty, and you may find things to read about that you didn't know about beforehand. Bowmaking is new for me,too, and I'm just trying to explain what I've recently learned. It's hard to get some of this info because it's scattered in different sources, and uses an unfamiliar jargon. So I'm explaining just what I've learned -- practically as I've learned it! I'm glad it appeals to you guys. The English longbow kinda intimidates me -- it needs very special wood to reproduce and the draw weights are tremendous. I'm comfortable around 40 lbs, and as you point out, it was common to exceed 100 lbs for military purposes. Those were the artillery of the day, intended to shoot long distance and through armor. I guess that would make the armored horseman the tank of the day, as well. Today they are often used in flight shooting -- long distance archery, highly specialized. I probably won't make a longbow because it is so specialized. I'm not a hunter, either, so some of the specialized hunting bows, very short and relatively higher draw weight have less appeal for me. Nor a horsemaan, in need of a short lower limb bow wigh exaggerated recurve. What I shoot for is sort of personal development and concentration, as well as a connection with ancient life, people and arts. So perhaps my bows will become specialized for my particular purpose as well. I very much Identify with Kyudo the Japanese art of archery, but i am not of that culture, and don't have the materials to mimic their highly developed bamboo bows. I like to use indigenous materials. So I guess what will develop will mimic my true interest. There is an ancient English bow, btw, that I am truly fascinated by, quite different from the longbow (except in length). It is the neolithic Meare Heath bow named for where it was discovered in the peat. I will surely build one of those soon except with local materials from my woods. I have a theory about the original design intent for that one, though I haven't seen anything in print about it. I'll probably talk about that more when I actually do start building one -- we'll see if my guesses are true in how it performs. Interesting that neolithic man also had Yew as the wood of choice for his bows. That's one of the things that I question about the design, Andrew. I'm sure the wood in the only extant example is yew if the archaeologists have identified it, but the design of the bow, to me at least, is absolutely perfect for lesser woods. It seems like everything was done to make a bow that could be made from lower stiffness high set material. The bow is very long, very wide (unlike longbows) and had leather and sinew bindings. If I had to design from scratch a bow for a lower quality wood, I would make it extra long (so the degree of curvature for the same draw length is reduced, thus reducing set), extra wide (so there is redundancy in wood fiber and more tolerance for irregularities), and as a safety feature, add cable support and banding to take some of the tension, and to prevent wood flying if it broke -- kinda like the way safety glass works -- and that's a perfect description of a Meare Heath bow. In fact such a big bow almost demands low stiffness woods, because the draw weight would otherwise be tremendous with a monster like that . English longbows are narrow and made of yew, and yet tillered to 100+ pounds. Imagine if you widened an extra long longbow (75") to oversize width (2"+), even by today's wide limb standards. It would be practically useless except as a club, or tillered so thin at the tips it would be fragile. I have a strong feeling that those bows weren't necessarily developed for yew, but were developed for a variety of woods, and the example found just happened to be made of yew in a traditional style. Maybe a special presentation or ceremonial bow, or maybe a yew preference developed over time from an earlier but retained "white wood" design, or maybe the bowyer saw a nice yew nearby one day and cut it and used in an older style bow. At any rate, it's a great design (I think) for many available white woods of lesser qualities, and that's what I'll be using to try that theory out. I love thinking about this stuff, and puzzling about the mysteries of design! I have some saved elm bark which I wanted to used for a handle wrap and binding for the grape vine handle. The bark was soaked overnight in a strem to soften it, cut into a 5/8" strip with tinsnips, then scraped with a hatchet. That removed the corky outer bark and left the thin inner bar. The bark was then rolled up, tied with string and soaked in linseed oil. I wiped off the excess oil and wrapped and tied it off on the handle area -- you can see a tag end sticking up while it's drying (and shrinking in place). That was later cut off. The bow has been finished some, because it would be tough to do that with the handle in place. I added a folded piece of bark as an arrow rest -- you can just see it sticking out from the handle here. I don't know if that is going to work well. Might be a little fragile. The heat reatment took out a lot of the string set as you can see here, and evened up the reflex in the tips some. The right (lower) limb still has some twist and thickness due to the big knot, but twists back by the tip. Compare this profile with the erlier one. Swarf, I'll try to vary the scenic backgrounds for you! That looks damn pretty finished. Yew would appear to have been regarded in a somewhat mystical way from very early times. Many church yards of very ancient origin have had Yew in them 'forever', very often enclosed in a palisade. The foliage (if so you can call it) is of course poisonous and this may have contributed to the mystic views. I seem to remember reading (sorry cannot quote source) that Yew clumps in Church yards often pre-date the churches, which themselves were often established on the site of pagan rituals. These handed down verbal stories can have very early roots so I suppose that it is entirely possible that they started in the neolithic post last ice age in Britain.